Despite a number of vegan options for pizza here in Indianapolis (WB Pizza and Mellow Mushroom), we often make our own vegan pizza at home. I was inspired to veganize a yummy sounding pizza in Vegetarian Times, and this has now become our “go to” pizza. 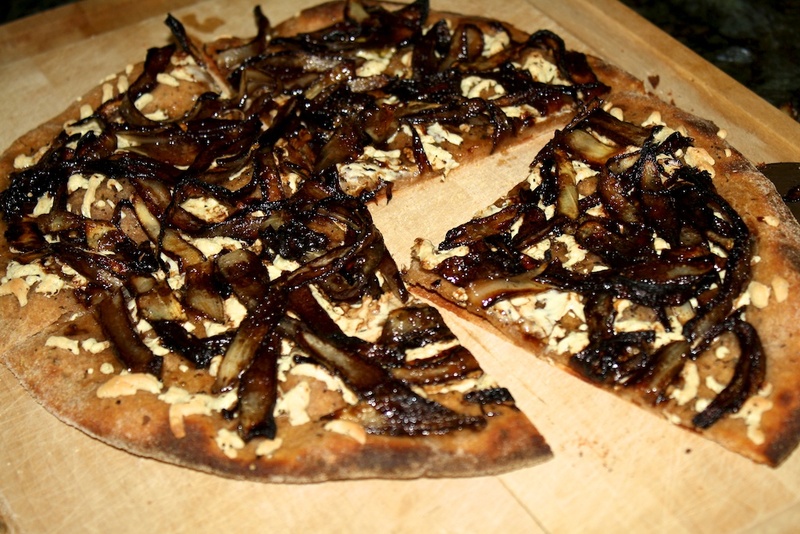 The April/May 2011 issue of Vegetarian Times has a Balsamic Onion, and Goat Cheese Pizza recipe by Mario Batali. For whatever reason, they haven’t yet added the recipe to their web site, but we modify it anyway for simplicity, improved yumminess, and of course to get away from the goat cheese. 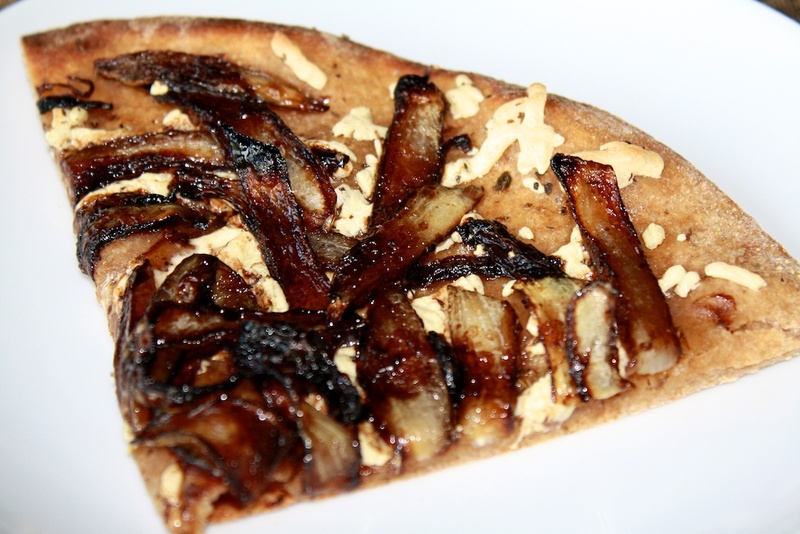 This pizza is simple, light, and the onions are amazing. The onions are definitely the focal point of this pizza, so you just use a sprinkling of vegan cheese to accent it (in fact, we’ve even done these without cheese). So yummy! For the crust, just use your favorite whole wheat dough recipe or a store bought vegan dough, like Trader Joe’s. Our favorite recipe is from our favorite book for bread, Artisan Bread in Five Minutes a Day. This is not a vegan or vegetarian cookbook but almost if not all of the bread recipes are vegan. It’s only the accompanying soup/sandwich recipes that are non-veg. Vegetarian Times also has a pretty good pizza crust recipe online. We make our pizza on a stone in the oven. Following a tip from Alton Brown, we use a ceramic tile (make sure you get unglazed) rather than a pizza stone, which is much cheaper. You will need a bread peel (very cheap at World Market), but it’s totally worth it. 1. Preheat your oven to 550 degrees (or as hot as your oven will go if it won’t go that high, you want the stone to have time to heat up). Prepare your whole wheat pizza dough and toss or roll it until it is 1/4″-1/2″ thin (I think a thinner crust works better with the lightness of this pizza). 2. Dust your pizza peel with corn meal (to help the dough slide on and off) and place your dough on the peel to rest. 3. Heat the oil and butter over medium-high until butter is completely melted and add onions. Cook onions until browned and then add water, balsamic vinegar, and sugar. Stir to blend, reduce heat to medium-low and cook until onions are tender and liquid reduces and becomes syrupy, around 10 minutes. 4. Let onions briefly cool. If you’d like, brush the dough lightly with olive oil and sprinkle Italian herbs on dough to taste (keep it light so the dough does not become soggy). Alternatively, once you’ve added the other toppings, lightly drizzle the olive oil on top of the pizza. 5. Sprinkle the vegan cheese on top of the dough. 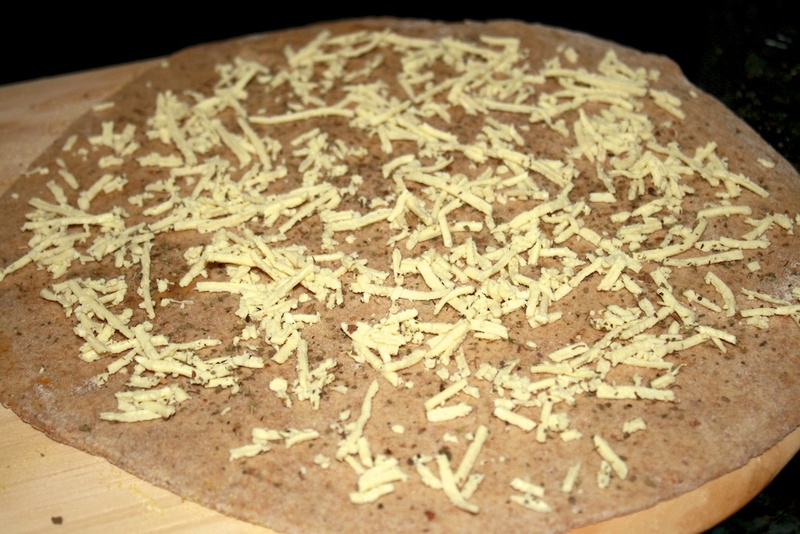 Go light with the cheese, don’t cover the dough, as the onions are the main flavor here, and strong vegan cheese, like Daiya, should act as a complement, not the dominant flavor. Sprinkle glazed onions on top of the cheese. 6. Carefully slide the dough onto the preheated stone. I sometimes find a pair of tongs can be helpful in getting the dough moving and then you can just wiggle the peel a bit to slide the dough onto the stone. 7. Bake for 6-8 minutes until crust is lightly browned. Slide the peel under the crust (tongs again can be helpful) and place pizza on cutting board to cool for a few minutes before slicing. We just use a sprinkling of cheese and sometimes even skip the cheese. If you do, drizzle or brush with a little more olive oil and up the amount of herbs you sprinkle on. As you can see, we go with a thinner crust, so it ends up to a be about a 10-12 inch pizza, but still light for just two people to enjoy. It also allows for a quicker baking time. Fresh from the oven, mmmmm! Be sure to transfer to a cutting board so you don’t mark up your pizza peel. The hardest part of this recipe is the dough and the time it takes to rise, so we usually make a large batch and freeze it. It’s a nice alternative to cheese-heavy or tomato sauce-based pizzas, light and sweet. Enjoy! Yum!! I would like to try this sometime. 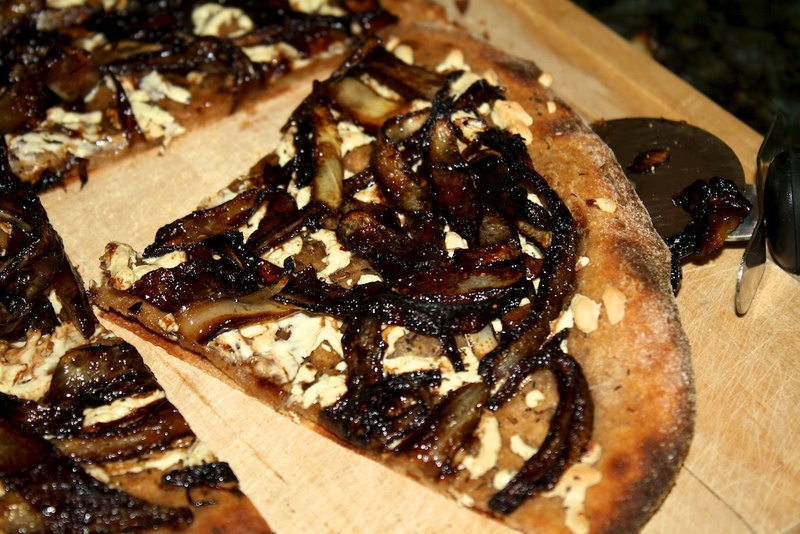 Caramelized onions are great. Karyn’s on Green has something similar, but in my opinion, their version is way too rich. I think I’d I like your light sprinkling of cheese much better. I hope you give it a try! Let us know how it turns out if you do. We’re missing Chicago’s restaurant scene….